If you work through this, you may find yourself feeling "What's the point?" Certainly, I do not expect that many people will be very interested in using the unit I am going to create in the course of the tutorial. The point of the unit is to take you through some mechanisms which are available to you in the Lazarus environment. It will be a little while before we come back to "units", bear with me? Always start with something basic, and build it up. The main problem with the above is that it is entirely non-tolerant of anything but numbers in the edit box. If you accidentally press a non-digit, or make the box empty, the program will crash. Just "break" out of the program (click "break" button of dialog) and "stop" it (button on toolbar, or ctrl-f2). Also, if you put a non-digit in the edit box, a new tab will open in the source editor, probably labeled "customedit.inc". Right-click the tab label, and invoke "Close Page". the program, even in it's simple form, will convert pounds to dollars! If you put 100 in the edit box, the label will immediately show (nearly) 150, which is, about, the number of dollars you can buy for 100 pounds. Yes, I would usually convert pounds to dollars by multiplying by 1.5, but dividing by 0.6666 is equally valid... and there is a reason I did it that way which isn't important to your learning experience, and which you will probably see in due course anyway. Yes, the program should be "fixed" to present the answer with only a reasonable number of decimal places. Trivial... but "important", if you want to call the result anything but crude. I don't want a polished result. I want to show you other things. Also, any decent exchange rate calculator would let you enter a number into either the "pounds" box, as you can do in this case, or into the "dollars" box, which you can't do here, seeing as the number of dollars is shown on a label. That fancier answer is again a question for another day. We're now going to start building a better answer. At first, sometimes the way we are doing things will seem like overkill. But we are "erecting the scaffolding" at this stage. Using a subroutine to set the exchange rate we are using is overkill. But as our application becomes fancier, we may be glad to have a place where all initialization tasks occur. We have set InitForEx up as a function, so that it can return a value to the calling code. That value will be used to send error messages back from the InitForEx subroutine's code. You'll see a new variable appearing in that... "FXrRate". That's variable intimately connected with the ForEx calculations, hence the FX prefix. The third character, the "r" is to say that this is holding data of the "real" "type". And "Rate" because it holds the rate we want used for our currency conversions. It is... for now... simply one of the program's global variables. And, for now, overkill. If you were to run the code, as described so far, you wouldn't see any changes in its behavior. But the way the code is written is getting better. "Better" in that, as more complexity is added, keeping track of what's going on will not become impossible to discern. Now we're going to take something we had before, and just "parcel it up". We aren't changing any code, not even by the tiny bit we "changed" the way the calculation was done, when we moved 0.66666 into a variable. No surprises in that, I hope? If there were, re-read the above, until it seems uncomplicated to you. There are reasons which I hope you do not already grasp... I will go into them later. The details remain available. The conversion from a string showing the pounds we had to a string showing the equivalent in dollars can be improved. We can limit the answer to however many decimal places we want... but that again will be something that happens inside the function (sCalcUSD). Those details won't be cluttering the part of the program were we need to know the number of pounds. Nor will why we want the figure in pounds be cluttering the part of the program where we create the string. I'm leaving the extra code to trim superfluous decimal digits as an exercise for you. It isn't important to this topic of using subroutines, and using subordinate units... which is what we are just about to come to. So far, so good, I hope. Now we're going to take the little program we've built so far, and just re-arrange the bits some. We won't be adding code. But we will be adding a unit... a "container" for some of the code we've already made. Invoke, from the main menu bar of the Lazarus IDE, "File / New Unit". In the window where your code was appearing previously, you now have a new tab. It is called "unit1" so far. Save it as "forexsrs" (for "FOReign EXchange SubRoutines"), and you will change the name, as well as doing the save we needed. Try running the program. Not a lot will have changed, but you shouldn't get any "complaints". (I will say "Run that" several times in the near future. Those two words should imply to you what I said at the start of this paragraph. I will suggest "Run that" at suitable points, so that you can be sure typos have not arise. Take the "FXrRate:real;" out of ldn029u1, and insert it into "forexsrs", along with a var above it, just before the "implementation" in "forexsrs". So far, nothing very major. We're going to take the "forward declaration" of InitForEx and the code saying what is wanted, the implementation, out of the program's main unit, ldn029u1, moving it to the forexsrs unit. .. which was in the interface section of ldn029u1. Move it to just above the "var" you recently added to the "forexsrs" unit. (This is within the unit's interface block, which was also the location of the line within ldn029u1). This goes into the forexsrs unit just after the word "implementation"... but you must make a small change. Did you spot it? What you have above is what should be left in forexsrs when you've finished the cut/ paste/ edit. It should still be running, as far as the user is concerned, as it ran before. But we have improved our code. It is, once you get used to what is going on, easier to read. We'll look at this more fully in a moment. In a similar way, move function sCalcUSD(rTmp:real):string; (and its code) from the main unit to forexsrs. A moment ago, I said that we'd improved our code... even though what the user would see was entirely unchanged. By moving "stuff" to forexsrs, we've created something which, once you get used to what is going on, is easier to read. And when it is easier to read, you can devote more of your little gray cells (brain) to making the program do wonderful things, and have less of your gray cells distracted by trying to stay on top of what you've done so far. It's a bit like the circus performer with spinning plates on sticks. Anyone can spin one plate on one stick. When you become good, maybe you can do two. If your code isn't difficult to read, maybe you can "spin" lots of "plates". And when it is easy to read, it is hard for bugs to hide from you. If you don't happen at the moment you have to look at this, which may in time be part of a much larger project, all of the details of sCalcUSD() are available to you... but they are tucked away, all nice and tidy, and not underfoot when your main focus is elsewhere. You need to know... it should eventually be spelled out in rems at the top of the ForExSRs unit... that before you call sCalcUSD(), you should have called InitForEx(). But even what's involved there has been "tidied away" into a discrete, logical place. Most things you do inside a program have some kind of pre-requisites. You may have noticed that we don't, within the subordinate unit, interact directly with any global variables. Neither do we do anything on the form managed by the main unit, or give rise (directly) to anything a user would see, for example a pop-up dialog. Not even something as simple as the results of a "showmessage()". This is deliberate. You can cheat, an, say, put at showmessage() in the subordinate unit. But it will come back to haunt you! Especially when, as you will, if you "walk" for a while before you try to "run", start using "standard" units (of your creation) across multiple projects. So far, we have been talking about a program to deal with a fairly trivial "need". Here's a quick example "from the real world" of something I use a standard (but created by me) unit for. I frequently want to turn dates into a much under-appreciated format... and back again to the more traditional representations. I would show 2nd December, 20 15 as 15c02... in essence, that's yymdd, where there's always SOMETHING for every letter, so leading zeros may be involved, as in showing the second of the month as "02", not just "2", and the month is a, b or c for October, November, December. Just by tacking my unit onto any project of mine which needs this, I can use a created- by- me RECORD TYPE, "TDmyInNumbers", which has three fields: Yr, Mnth, Day. Whew! Aside is FINISHED!.... Skimming the text is no longer safe! We're creating a unit, because it is a Good Idea. I've recently been saying "subordinate unit", to distinguish it from the main unit. From now on, unless I say "main unit", assume that I usually talking about the subordinate unit. I've said that you shouldn't access global variables in the unit. Or send things to the screen. Here are some examples of how we avoid doing that in places where we might be tempted. We calculate the number of dollars a given number of pounds represents by dividing by a constant. Something of a dog's dinner... but it "would do" to guard against setting the exchange rate to zero. and it does avoid having a showmessage inside our (subordinate) unit. But what a lot of "stuff" to incorporate, and remember to incorporate, into the main unit of any program using InitForEx(). 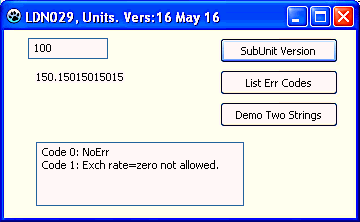 (remember- eventually, you will be re-using these units across multiple programs. This is so much more clear, tidy, amenable to further extension, etc.! Why did I say "search on 12May16a"? Because I was writing this on that date, and knew how many error codes I had assigned already that day. (Even I can remember (or use "find" to discover) error codes assigned since dawn.) If I needed more unique- across- all- the- programming- I- have- ever- done ID codes the next day, the first one would be "13May16a". The next 13May16b, etc. If you feel that "bits" (apart from separating a unit from the project it first appears in) haven't been made clear yet, perhaps re-read the above. I'm going to move on now, into new pastures. Until now, if you entered a non-digit in the edit box, or made it empty, the program did not respond graciously. We can fix that. Our fix won't be very elegant, but it will be a big improvement over what we had before! //Something about the following makes me "itch". //I suspect it could be done better! "But it works". Whew! If you don't like attending to details, you wouldn't be a programmer! Moving on to something which will be more fun, I hope, and something more generally useful, instead of the little details we've been getting right. We have "broken out" of the main unit two subroutines. One calculates the value, say, of $100 in British pounds. But! Before we can call that subroutine without tears, we must have called the InitForEx subroutine. Here is how we can ensure that we don't someday re-use the ForExSRs subroutine, but forget the need for the preliminary call to InitForEx. First we create a boolean variable within ForExSRs. It is called boIniCalled. In the fragment below, the creation of boIniCalled only takes one line, but I've copied several lines, so you can see where that line goes. However, this would not be the best answer. Everything I've said so far is fine, up to "then showmessage...."
We want (really!) to avoid having anything inside our subordinate unit "talk" directly to the outside world. So. How do we avoid this? What we will do, instead of using showmessage to report the problem, is that we will create a "rogue value" for the result of sCalcUSD. (Much of the code below is "old"... An "if... then..." has inserted, wrapping the old code in its "else". The bit at the top is new. And remember: We took steps to ensure that boIniCalled would be false, unless the InitForEx in the ForExSRs unit has been called. That's it! For that. "Easy when you know how." When we create sub-units like ForExSRs, we try to avoid having them talk to the outside world... and it can be done, without great hassle. We don't want them popping up ShowMessage boxes, etc. We certainly don't want them directly accessing, to read or to write, global variables outside the scope of the unit. We don't want them fetching values directly from edit boxes on the main unit's form, not writing directly to them. If these rules are observed, it becomes much easier to "re-cycle" the units... a great "bonus" which is yours, on top of the value of the sub-units towards making the main unit uncluttered, easy to read, easy to work on. Take, for instance, in our simple exchange rate calculator example: If we sent the "answer" directly to the form, then the sub-unit would only be useful when used with a main unit which created a form with a label of the right name. I am new to using sub-units. I have to confess that the want which inspired this tutorial seems to break my rule. The unit I want to write will access a file of data on the hard drive. But the specs of WHICH file will be gathered in the main unit. And all access to the file will be within the sub-unit. So I think the virtue of portability between programs will be maintained. I'll know more when I'm done! ... you have a way when running the program to see which version of the units was used to compile the program. Of course, this simple answer assumes that you can be sure that the line in the sub-unit will be changed each time you make any changes to the sub-unit. Beautifully written code doesn't need a lot of documentation. But there are always blemishes in our code, and documentation is a Good Idea anyway! So, at the head of the sub-unit, be sure to write up what the sub-unit is for. It also pays to add comments explaining what your different variables are used for, what limits exist on values they may have. In the case of the example unit, for instance, it would be wise to put next to the declaration of FXrRate that it must not hold zero. A while ago, we programmed InitForEx to return 0 if no error was encountered during the initialization process, and to return 1 if a user tried to set the exchange rate to zero. We make such a request an "error", because the way the program is written means that we divide another number by the exchange rate, and mathematics doesn't allow dividing by zero. While what we have is adequate, and it is little trouble to use, if we have access to the code behind the sub-unit ForExSRs, we can make things even easier. What I am about to discuss is probably over-kill here, but you may well find the techniques useful in real-life circumstances. We're going to create a new functions in ForExSRs, a function return strings which will say what the error codes mean. The function will have two parameters. The first will say what error code needs interpreting, the other will select the form of the answer: a short string, with an abbreviated explanation, or a longer string, with a longer explanation. ... which, in this isolated, simple case may seem cumbersome. A larger program, with a larger set of defined error codes, would be more happily managed through a scheme like this, where all of the possible codes are in one place, in a tidy list, to be used whenever necessary. //   of the error. Longer explanations are the alternative. I am a "one man band". Only I work on any of my code. However, in a bigger organization, you will sometimes find that "team A" produces a unit for other teams to use, and the other teams are "locked out" of the details of HOW the unit does what it does... they are only told (and only care about) what sub-routines are available from the unit, how to call them, and what they will return. I tend to write up the "how to call"/ "what is returned" just before the code, in the "implementation" section. However, you can make a good case for putting that information in remarks associated with the forward declarations of the sub-routines, up in the "interface" section of the unit. Done properly, these remarks can save you a lot of time. It also pays to write them before you write the code. There is nothing like having a clear spec for what something is going to do, while you are writing it, to help you stay on course, do what was needed, rather than something it drifted into being. And finally... returning multiple elements. I said that the sub-unit should not directly change the values in any global variables. Suppose you want to a function which returns more than one value? We could, for instance, although it stretches the credulity a little, have wanted an exchange rate calculator which returned the equivalent of a GBP amount both in dollars and in, say, Euros. We would need to add an exchange rate, similar to FXrRate. We'd call it FXrRateEuro. Then we could create a function called sCalcDollarsAndEuros.... but it would have to return TWO strings. Other than that, it would work more or less as our earlier sCalcUSD. How do we get it to return two strings? If the rest of this is Just Too Much, then let it go. Even without using user-defined records (the subject of the rest of this), you can do a lot with sub-units. My apologies for rushing what follows. I mentioned user-defined records earlier in this tutorial, and they are one of the subjects in my Lazarus tutorial "User-defined records and reading from disc files". Now we have a TYPE, TFXudrTwoStrings, which didn't exist before. How do we use it. the local VARIABLE we have created, udrTmpMain, has two "parts". The sDollars part, and the sEuros part. The "part-names" are fixed; they were determined by the code at the top of the subunit which creates the TYPE: TFXudrTwoStrings. As with any other type, you can have many variables all of that type. We have on in the subroutine above. We "fill" the sDollars part of udrTmpL with 100... not with a calculated value, which we would do if we really wanted the program I described. We "fill" the sEuros part of udrTmpL with 85. Because udrTmpL consists of the two parts just mentioned, we can do this. We have arranged for two values ("100" and "85") to pass back to the calling code (in the main unit) from the procedure in the sub-unit. Magic! and useful! It takes a little "getting used to", but it is how you avoid direct access to multiple variables in the main unit when a subroutine you want to have in the sub-unit computes more than one value. You can do it! It just takes a little practice. The whole project, with an already compiled .exe can be downloaded in a .zip file. Download sourcecode and .exe for LDN029- Using Units in Lazarus. (Delphi does more or less the same things.) Enjoy! Feedback appreciated. What was helpful to you? What was obscure?